When the interval between a transient flash of light (a "cue" ) and a second visual response signal (a "target") exceeds at least 200 ms, responding is slowest in the direction indicated by the first signal. This phenomenon is commonly referred to as inhibition of return (IOR). The dynamic neural field model (DNF) has proven to have broad explanatory power for IOR, effectively capturing many empirical results. Previous work has used a short-term depression (STD) implementation of IOR, but this approach fails to explain many behavioral phenomena observed in the literature. 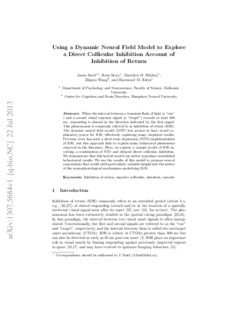 Here, we explore a variant model of IOR involving a combination of STD and delayed direct collicular inhibition. We demonstrate that this hybrid model can better reproduce established behavioural results. We use the results of this model to propose several experiments that would yield particularly valuable insight into the nature of the neurophysiological mechanisms underlying IOR.